This former bank building, situated on the outskirts of Manchester City Centre, has a stunning contemporary interior so the brief for the team from Hydropool Manchester was to create an outside living and entertaining space with the same quality and style for its new owners. It just happens to be on the roof. Evening entertaining plays a big part in their lifestyle so they wanted the hot tub to look amazing when viewed from the outside as well as a spa to relax in after a hard days’ work to ease out all the stresses of the day. The 670 Platinum was chosen for its easy to maintain Self Cleaning System and the Pre-installed Wellness Programs which take all the guesswork out of which jets should be used for a specific massage effect. Once the work on a new third floor staircase and sliding glass roof hatch were complete the team set about designing a raised deck area to incorporate the hot tub. The front of the roof terrace has a raised front wall so it made sense that the hot tub should be positioned in a secluded corner whilst making the most of the views from the hot tub along the three lower walls. 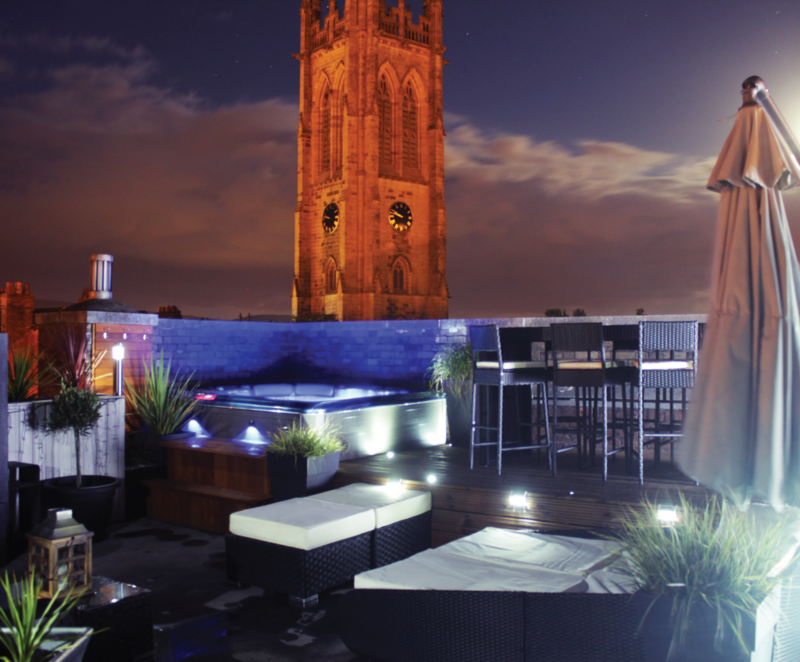 The imposing clock tower of the church also creates a dramatic backdrop to the hot tub when viewed from the seating area. Getting the height of the raised deck was crucial to allow views along the road but still maintain privacy when standing on the deck. The street outside the property is main access road into the busy town and the height of the building is 12m. On consultation with the crane hire company and after a site visit by them, it was decided that a compact city crane was the best option to lift the hot tub.